Or, perhaps in their situation, it was a bit more renovate and they will come. Whatever the case, the two partners behind Temple on Queen in Bridgetown have created what has the making of a thriving business, built on a foundation of a promising catering operation and a renovated old church. And according to D’Aubin, they couldn’t have done it without Annapolis Ventures. “I think the process of working with Elizabeth [Rice, executive director] at Annapolis Ventures was quite seamless. She was easy to work with and very supportive of the venture. We appreciate that,” she said. It wasn’t the first time D’Aubin had connections with the Bridgetown branch of Communities Business Development Corporations (CBDC). About a year and a half ago, her family’s business, D’Aubin Family Meats, had obtained a small loan for a mobile sausage cart to use at markets. The ball got rolling on Temple on Queen roughly about the same time. That was when D’Aubin Family Meats set up a sideline business to their butcher shop, called DFM Catering, which was inspired by MacDonald. “That took off like wildfire, with very minimal advertising. Kind of shockingly so,” says D’Aubin. They catered a few weddings in 2016, and soon were taking bookings for this year and 2018. “It's a little overwhelming even,” D’Aubin says with a bit of a chuckle. She notes that other than giving the catering operation a section on the D’Aubin Family Meats website, they’ve done little to promote it. Meanwhile, MacDonald had been holding the old Rothsay Masonic Temple on Queen Street in Bridgetown. She bought the late nineteenth-century Gothic Revival style building, which first opened in 1871 as a Presbyterian Church, in 2009,with the intention of converting it into a wedding venue. But the project remained on the back burner until the catering service took off and MacDonald and D’Aubin began sharing the same vision. In January of this year, D’Aubin and MacDonald decided to do the Temple business together. They had some initial help from a private investor who has also invested in D’Aubin Family Meats. “But of course, as these things go, especially with an old building, it cost about double what we originally thought it was going to cost to complete the renovations on it. And so that's when we approached Annapolis Ventures,” explained D’Aubin. MacDonald turned to the organization as the landlord of the Temple building, and received a $20,000 loan for structural upgrades such as brick work, beam replacements and work on the sewer mains. And the pair approached the CBDC as the Temple on Queen partnership for another $20,000 loan “to continue with renovations that would make it suitable for what we wanted to do,” says D’Aubin. 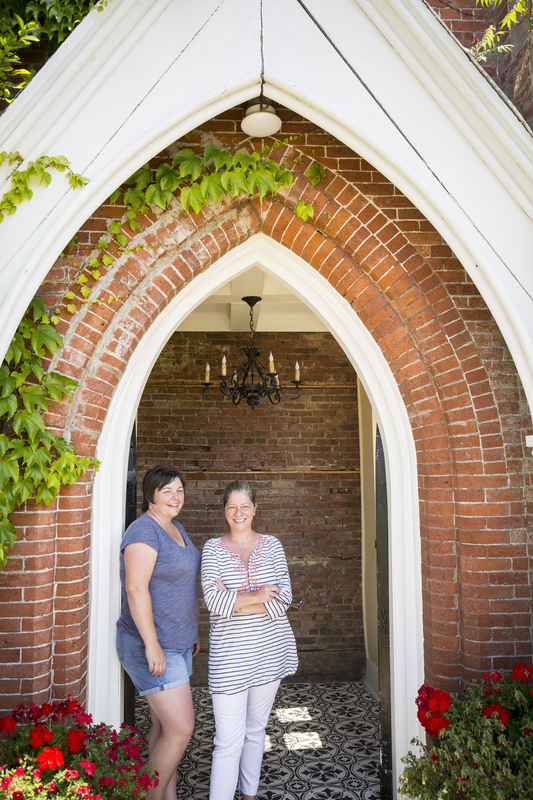 The partners presented Annapolis Venture with their business plan which saw the building being used as a venue for not just weddings, but anniversary and birthday parties as well. Additionally, they intend to use the space as a backdrop for special events they themselves organize and cater, which have either a food or entertainment focus. They had their first event at the venue June 16, when they hosted the annual general meeting of the Bridgetown and Area Chamber of Commerce, and catered the dinner for 60 people. On July 13, they were expecting to have their first entertainment event with food, featuring the local band, The Idle Threats. A birthday party was on the cards for shortly after that and they had a wedding booked for August. “The feedback has been really, really good. It's a beautiful venue and everybody that's been in it has just been amazed with the transformation.,” reports D’Aubin. Meanwhile D’Aubin and MacDonald are applying to Annapolis Ventures for further assistance with training in bookkeeping and digital marketing. The impact of the business promises to be more than just the former church on Queen Street. The partners have rallied together individuals and businesses in the area, including a printer, florist, brewery, vineyard, artist and band, to assist them in offering a $10,000 wedding as a contest prize. “It's over 25 local vendors. That's the exciting part,” enthuses D’Aubin,, noting that they’ll be giving the vendors exposure through their social media and the event itself. And it’s not just the Bridgetown area they see as their market. D’Aubin’s research indicates people are willing to travel up to two hours to a wedding venue. “If you look at what our radius is, that means we have the ability to attract folks from [Halifax]. I think that we're so unique, once word gets out, we will be able to do that,” she says.